Context: Luteal phase defect has been identified in all assisted reproductive technology cycles, necessitating progesterone supplementation. Aims: The aim of our study was to assess whether mid-luteal serum progesterone (P) levels' impact pregnancy outcome in fresh and frozen embryo transfer (FET) cycles. Settings and Design: A total of 145 women undergoing embryo transfer (ET) were prospectively enrolled and received standard luteal phase support. Methodology: Serum progesterone levels were assessed for all the patients in the mid-luteal phase. Patients were divided into groups based on the type of ET performed. Group A – fresh ET and Group B – FET. These groups were further subdivided based on mid-luteal serum P levels being below (Groups A1/B1) or above 15 ng/mL (Groups A2/B2). Progesterone levels were correlated with the clinical pregnancy outcome. Statistical Analysis Used: Chi-square test was used for qualitative analysis, and student's t-test was used for comparison of means. Results: Patients with mid-luteal serum P levels <15 ng/mL (Group A1) in fresh ET cycles had a statistically significant lower clinical pregnancy rate (CPR) (P = 0.049). 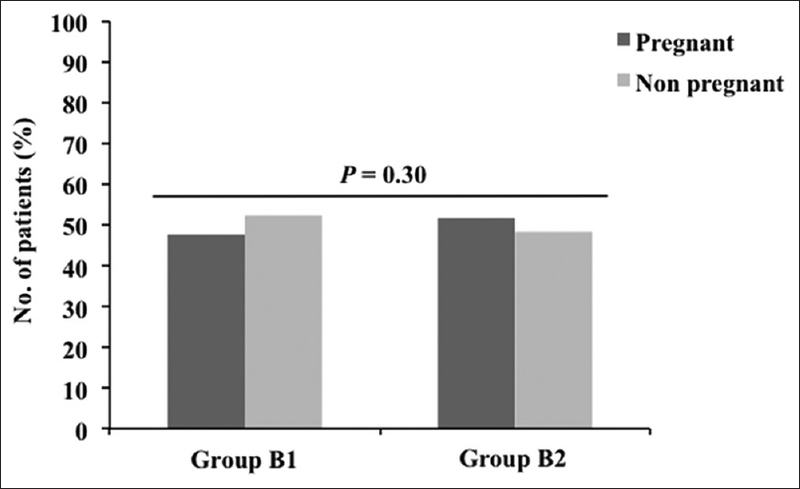 In FET cycles, though there was no difference in the CPR, the percentage of biochemical pregnancies was significantly higher in the group with P levels <15 ng/mL (Group B1) (P = 0.024). Conclusions: This study suggests that, in Indian women, mid-luteal serum P levels <15 ng/mL have a negative impact on pregnancy outcome in both fresh (<CPR) and FET (>biochemical pregnancies) cycles. Individualizing luteal phase support by measuring serum progesterone levels might help to enhance pregnancy outcomes. Postovulatory progesterone-secretion by the corpus luteum is critical to bring about endometrial changes essential for implantation and a successful pregnancy outcome. Progesterone (P) modulates the expression of ultrastructural hallmarks of the secretory phase endometrium such as giant mitochondria, subnuclear glycogen deposits, pinopodes, and nucleolar channel system facilitating implantation. It is also thought to facilitate implantation by promoting the immune system to produce noninflammatory T-helper-2 cytokines., In the presence of sufficient progesterone, CD56 cells synthesize progesterone-induced blocking factor which is projected to have antiabortive activity. Progesterone also promotes nitric oxide production which improves blood flow and oxygen to the endometrium. 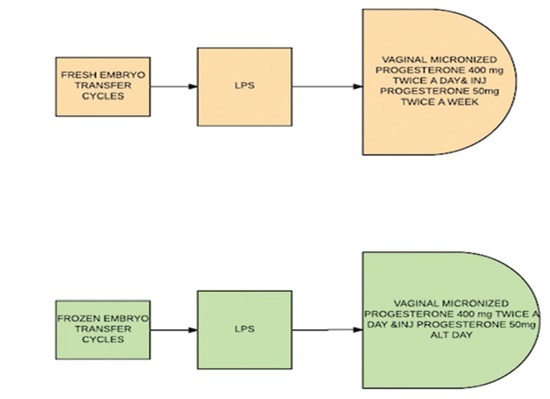 The importance of progesterone during the process of implantation and early pregnancy cannot be overemphasized and it seems plausible that LPD might be a cause of failing implantation and early pregnancy loss (EPL) in ART., Studies suggest that fresh in vitro fertilization–embryo transfer (IVF-ET) cycles, in which conceptions occur, have a more rapid rise of progesterone and higher mid-luteal progesterone levels compared to nonconception cycles. There is a paucity of literature on the luteal serumP levels in frozen ET (FET) cycles, and a cutoff level for mid-luteal serum P that may influence the outcome of IVF-ET cycles has not been defined. It is also not clear whether increasing progesterone supplementation can improve implantation rate. We conducted a study to elucidate the effect of mid-luteal serum progesterone levels on pregnancy outcome in ART cycles. The aim of the study was to assess whether mid-luteal serum progesterone levels' impact pregnancy rate and EPL in fresh and FET cycles in women of Indian ethnicity. A total of 145 women undergoing fresh and FET at a tertiary care ART Centre between April 2016 and October 2016 were enrolled in the study, after obtaining written and informed consent. Ethical clearance was obtained. The study design was a prospective cohort study. Patients <40 years undergoing both fresh and FET cycles at our ART center during the study period were included in our study. Patients with a history of recurrent implantation failures and poor embryo quality were excluded from the study. Patients wherein a change in luteal phase support was required due to inability to tolerate vaginal/injectable progesterone were also excluded from the study. GnRH antagonist protocol with gonadotropin stimulation was followed for IVF in all the patients enrolled in our study. Dose of gonadotropin was decided based on the patient's age, body mass index (BMI), ovarian reserve, and previous response. Ovarian stimulation was done with recombinant follicle-stimulating hormone (follitropin-alfa Gonal-f ®, EMD Serono, Inc.,) forfirst 5 days followed by Menopur (highly purified HMG-Ferring Pharmaceutical Ltd.). GnRH antagonist (Cetrotide, Merck, Serono) was started according to the flexible protocol. Injection human chorionic gonadotropin (hCG) 10,000 IU was given as trigger in all the patients [Figure 1]. OR was done 36 h later under general anesthesia, using transvaginal ultrasound guidance. Luteal support was started 1 day after OR and urine pregnancy test and beta-hCG were measured 14 days after ET. A pregnancy test was considered positive if the β-hCG levels exceeded 25 IU. Clinical pregnancy was defined by the presence of a gestation sac with cardiac activity. Biochemical pregnancy was defined by falling hCG titers with nonvisualization of gestation sac on ultrasound. In fresh ET cycles, luteal phase support included vaginal micronized progesterone 400 mg twice a day and injectable progesterone in oil 50 mg intramuscular twice a week. In FET cycles, vaginal micronized progesterone 400 mg twice a day and injectable progesterone 50 mg intramuscular alternate day was administered for patients with BMI <35. Injectable progesterone 50 mg intramuscular was given daily in cases having BMI >35 [Figure 2]. 2cc of blood was collected in a plain vacutainer andPlevel was analyzed in serum after centrifugation using the automated chemiluminescence microparticle immunoassay. SerumPlevel was measured on day 3 after a blastocyst transfer and day 5 after a cleavage stage (day 3) transfer, corresponding to the mid-luteal phase. Patients were divided into two groups based on the type of ET performed: Group A – fresh ET and Group B – FET. These groups were further subdivided based on serumP levels: Group A1:P levels <15 ng/mL and Group A2:P levels > 15 ng/mL and Group B1:P levels <15 ng/mL and Group B2:P levels >15 ng/mL. Presults were correlated with the clinical pregnancy outcome [Figure 3]. Continuous variables are presented as mean ± standard deviation, and categorical variables are presented as absolute numbers and percentage. For all statistical tests, the Chi-square test was used for qualitative analysis and student's t-test was used for comparison of means. All data analyses were carried out by the SPSS program for Windows version 21.0.A (SPSS Inc., Chicago, IL, USA). P < 0.05 was considered a significant difference. In the fresh ET cycles (Group A), we observed that there was no difference in the age, BMI, anti-Mullerian hormone, starting dose, the total days of stimulation, estrogen levels andP levels on the day of hCG trigger, number of oocytes retrieved, and the number of embryos transferred between the groups having progesterone levels <15 ng/mL and >15 ng/mL [Table 1]. 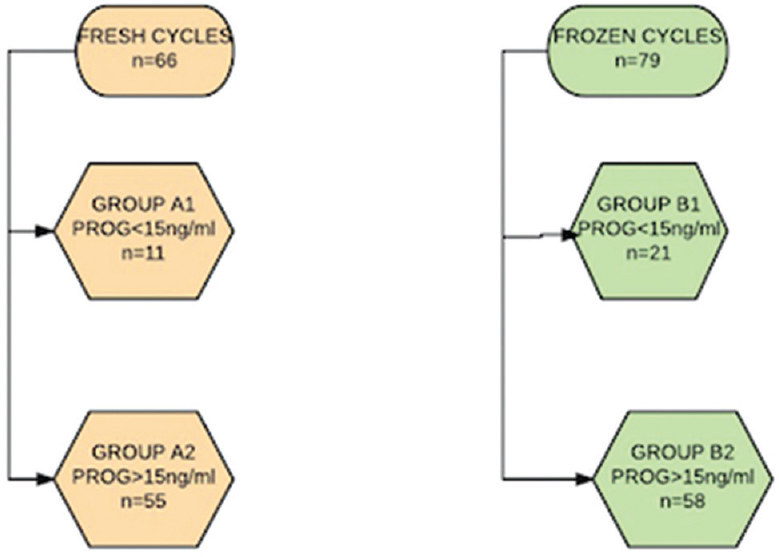 In fresh ET cycles, of the 66 women recruited, 11 patients had serum P < 15 ng/mL (Group A1). Of these, only 9.1% (1/11) became pregnant. 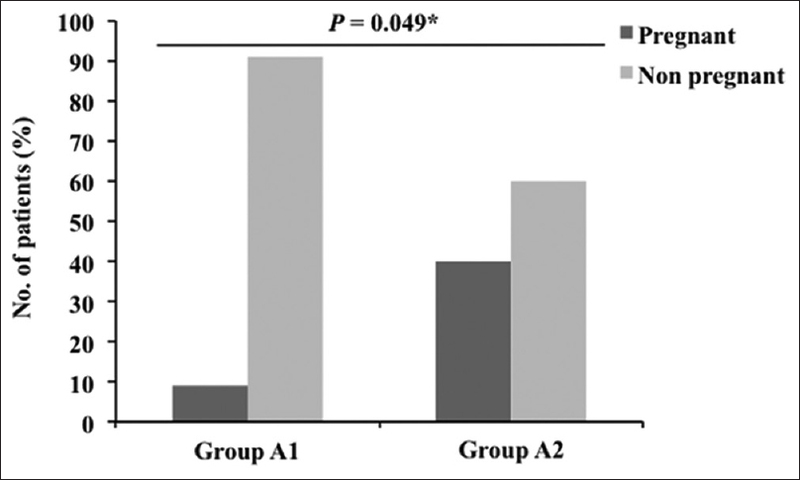 Of the 55 patients in Group A2 (P > 15 ng/mL), 40.0% (22/55) became pregnant (P = 0.049) [Figure 4]. There were 13.6% (3/22) biochemical pregnancies in Group A2 (P = 0.48). In the FET cycles (Group B), we did not find any difference in the age, BMI, and endometrial thickness between the two groups, i.e., B1 – P< 15 ng/mL and B2 - P > 15 ng/mL [Table 2]. Of the 79 women recruited in Group B (FET cycles), 21 cases were in Group B1 (P< 15 ng/mL) and 47.6% (10/21) achieved pregnancy. Of the 58 patients in Group B2 (P > 15 ng/mL), 51.7% (30/58) cases became pregnant. 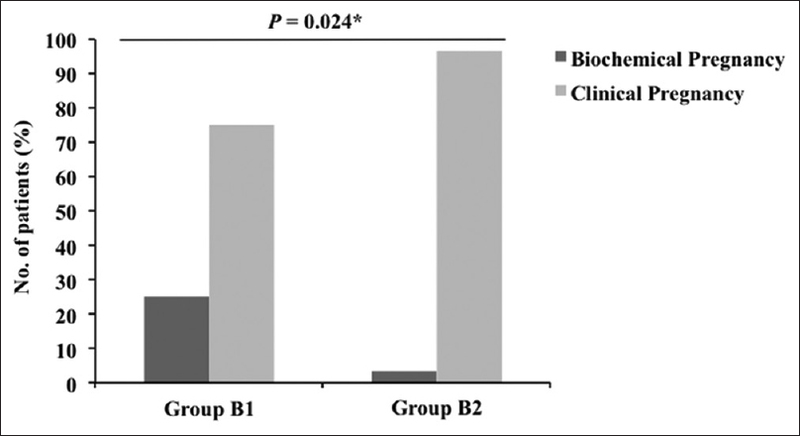 There was no significant difference in the clinical pregnancy rate (CPR) among the Groups B1 and B2 (P = 0.30) [Figure 5]. However, the biochemical pregnancies were significantly higher in Group B1 (P< 15 ng/mL). The overall biochemical pregnancy rate (PR) was 10.0% (4/40), of which 75.0% (3/4) were in Group B1 (P< 15 ng/mL) and only one was in Group B2 (P > 15 ng/mL) (P = 0.024) [Figure 6] which was statistically significant. Adequate progesterone secretion in the luteal phase of IVF-ET cycles is important to ensure implantation and pregnancy sustenance. SerumPassay has been proposed as a surrogate marker of endometrial competence and can help define a "fertile" luteal phase. 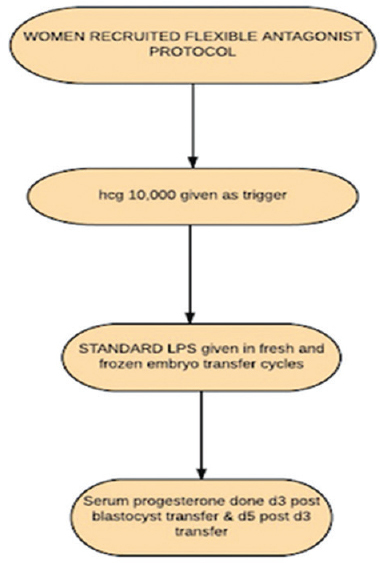 LPD has been identified in fresh IVF cycles, and progesterone administration is mandatory to achieve good PRs. Insufficient progesterone supplementation may be one of the reasons for low pregnancy rates despite transfer of morphologically good embryos. Unfortunately, there is a paucity of studies on the correlation of serumP levels in the luteal phase and pregnancy outcome. Some studies have suggested thatP levels below 15 ng/mL in serum are associated with a decreased PR or increased EPL. We analyzed the impact of mid-luteal serumP levels on pregnancy outcome in fresh and FET cycles in women of Indian ethnicity. A progesterone level of 15 ng/mL was taken as the cutoff, based on previous studies. In fresh IVF cycles, patients in Group A1 and A2 (P < 15 and >15 ng/mL, respectively) had similar demographics, ovarian reserve, days of stimulation, OR, estradiol, andP levels on day of trigger (P< 0.05). Patients withP level <15 ng/mL in fresh ET showed a statistically significant lower PR (P = 0.049), implying a negative effect of low lutealP levels. Our study corroborates the findings of Liu et al., who demonstrated that patients with viable pregnancies had significantly higher mean serum P concentrations during the early luteal phase than nonpregnant patients or those who had an early miscarriage. A similar association was reported by Ellenbogen et al., and Mitwally et al. using a cutoff level of 15 ng/mL for P., In contradiction to their own earlier study, a prospective randomized controlled trial (RCT) done by Aslih et al. reported that biochemical PR, clinical pregnancy, and live birth rates were comparable between groups regardless of P level on day 7 of luteal phase (P< 15 or >15 ng/mL). This result did not change even after stepping upPdose in the lowPgroup. It is possible that increasing progesterone dose so late in the luteal phase could not improve endometrial milieu adequately. A biochemical pregnancy rate of 13% was observed in our study in Group A2 (P > 15 ng/mL). This result could reflect an embryonic factor. In our FET cycles (Groups B1 and B2), age, BMI, and endometrial thickness on the day of ET were comparable between groups (P< 0.05). There was no difference in the CPR in patients with P < 15 ng/mL or > 15 ng/mL (47.6% and 51.7%, respectively). However, the percentage of biochemical pregnancies was significantly higher in Group B1 (P< 15 ng/mL). Overall, there were four biochemical pregnancies (10%), of which three (75%) were in Group B1. This suggests that low mid-lutealP levels may be detrimental to pregnancy sustenance. Studies have shown that EPL may result not only from chromosomally abnormal embryos but also from malfunctions of the endometrium or both. Humaidan et al. reported that biochemical pregnancies were inversely correlated with the mid-luteal serumPconcentration. A sharp decline in the EPL rate from about 80% to 10% was seen as the mid-luteal-phaseP concentration increased from about 40 nmol/l (12.57 ng/mL) to about 80–100 nmol/l (25.15–31.44 ng/mL). Alsbjerg et al. evaluated the reproductive outcome in patients receiving frozen-thawed ET before and after doubling vaginal progesterone gel supplementation from 90 mg to 180 mg. They reported a significant decrease in the EPL rate (67% vs. 44%, respectively, P = 0.014) and a significant increase in the delivery rate (9% vs. 21%, respectively, P = 0.002) with increasedPdosage. Our study suggests a negative impact of low mid-luteal serum progesterone levels in both fresh (low CPR) and FET cycles (higher biochemical pregnancies). It is known that the implanting embryo embarks on hCG production during the second half of the luteal phase, bringing about a luteotropic effect. Stimulation of the corpus luteum leads to sustainedP secretion which is vital for implantation and growth of a healthy pregnancy. It can be postulated that, in fresh IVF cycles, inadequate signals from the implanting blastocyst fail to bring about a suitable corpus luteum rescue, leading to decreased progesterone secretion and failure of implantation. Timely progesterone supplementation might overcome this deficiency. In our study, mid-lutealP levels did not affect PRs in FET cycles probably becausePsupplied extraneously is sufficient to induce endometrial receptivity. However, lowP levels were unable to sustain the pregnancy possibly because of inadequate immune and/or vascular endometrial alterations. An embryonic factor can be contributory though all patients included in our study were below 40 years, and we can assume a similar aneuploidy rate. A limitation of the study was the small patient number. Larger RCTs are required to confirm these results. Our study suggests that, in Indian women, mid-luteal serumP levels <15 ng/mL have a negative impact on pregnancy outcome in both fresh (<CPR) and FET (>biochemical PR) cycles. Measuring serum progesterone levels in the early luteal phase may enhance pregnancy outcome in ART cycles by providing an individualized luteal phase support. I would like to acknowledge the contribution of Dr. Priya Bhardwaj for helping with the manuscript preparation. Zapantis G, Szmyga MJ, Rybak EA, Meier UT. Premature formation of nucleolar channel systems indicates advanced endometrial maturation following controlled ovarian hyperstimulation. Hum Reprod 2013;28:3292-300. Druckmann R, Druckmann MA. Progesterone and the immunology of pregnancy. J Steroid Biochem Mol Biol 2005;97:389-96. Szekeres-Bartho J, Wilczynski JR, Basta P, Kalinka J. Role of progesterone and progestin therapy in threatened abortion and preterm labour. Front Biosci 2008;13:1981-90. Wetendorf M, DeMayo FJ. The progesterone receptor regulates implantation, decidualization, and glandular development via a complex paracrine signaling network. Mol Cell Endocrinol 2012;357:108-18. Simoncini T, Caruso A, Giretti MS, Scorticati C, Fu XD, Garibaldi S, et al. Effects of dydrogesterone and of its stable metabolite, 20-alpha-dihydrodydrogesterone, on nitric oxide synthesis in human endothelial cells. Fertil Steril 2006;86:1235-42. Van Steirteghem AC, Smitz J, Camus M, Van Waesberghe L, Deschacht J, Khan I, et al. The luteal phase after in-vitro fertilization and related procedures. Hum Reprod 1988;3:161-4. Fatemi HM, Popovic-Todorovic B, Papanikolaou E, Donoso P, Devroey P. An update of luteal phase support in stimulated IVF cycles. Hum Reprod Update 2007;13:581-90. Yanushpolsky EH. Luteal phase support in in vitro fertilization. Semin Reprod Med 2015;33:118-27. Messinis IE. Ovarian feedback, mechanism of action and possible clinical implications. Hum Reprod Update 2006;12:557-71. Laufer N, Navot D, Schenker JG. The pattern of luteal phase plasma progesterone and estradiol in fertile cycles. Am J Obstet Gynecol 1982;143:808-13. Arce JC, Balen A, Platteau P, Pettersson G, Andersen AN. Mid-luteal progesterone concentrations are associated with live birth rates during ovulation induction. Reprod Biomed Online 2011;22:449-56. Baird DD, Wilcox AJ, Weinberg CR, Kamel F, McConnaughey DR, Musey PI, et al. Preimplantation hormonal differences between the conception and non-conception menstrual cycles of 32 normal women. Hum Reprod 1997;12:2607-13. Liu HC, Pyrgiotis E, Davis O, Rosenwaks Z. Active corpus luteum function at pre-, peri- and postimplantation is essential for a viable pregnancy. Early Pregnancy 1995;1:281-7. Stavreus-Evers A, Nikas G, Sahlin L, Eriksson H, Landgren BM. Formation of pinopodes in human endometrium is associated with the concentrations of progesterone and progesterone receptors. Fertil Steril 2001;76:782-91. Jordan J, Craig K, Clifton DK, Soules MR. Luteal phase defect: The sensitivity and specificity of diagnostic methods in common clinical use. Fertil Steril 1994;62:54-62.
van der Linden M, Buckingham K, Farquhar C, Kremer JA, Metwally M. Luteal phase support for assisted reproduction cycles. Cochrane Database Syst Rev 2011:CD009154. Ellenbogen A, Gidoni Y, Michaeli M, Rotfarb N, Ballas S. Mid-luteal serum progesterone and estradiol levels as predictors of pregnancy in IVF-ET cycles: May increasing the dosage of progesterone supplementation improve the outcome? Fertil Steril 2004;82:S205-6. Mitwally MF, Diamond MP, Abuzeid M. Vaginal micronized progesterone versus intramuscular progesterone for luteal support in women undergoing in vitro fertilization-embryo transfer. Fertil Steril 2010;93:554-69. Aslih N, Ellenbogen A, Shavit T, Michaeli M, Yakobi D, Shalom-Paz E, et al. Can we alter pregnancy outcome by adjusting progesterone treatment at mid-luteal phase: A randomized controlled trial. Gynecol Endocrinol 2017;33:602-6. Yding Andersen C, Vilbour Andersen K. Improving the luteal phase after ovarian stimulation: Reviewing new options. Reprod Biomed Online 2014;28:552-9. Humaidan P, Bungum L, Bungum M, Yding Andersen C. Rescue of corpus luteum function with peri-ovulatory HCG supplementation in IVF/ICSI GnRH antagonist cycles in which ovulation was triggered with a GnRH agonist: A pilot study. Reprod Biomed Online 2006;13:173-8. Alsbjerg B, Polyzos NP, Elbaek HO, Povlsen BB, Andersen CY, Humaidan P, et al. Increasing vaginal progesterone gel supplementation after frozen-thawed embryo transfer significantly increases the delivery rate. Reprod Biomed Online 2013;26:133-7.